This Page gives a quick overview of the algorithms used. We have written some papers about the implementation, where all the details can be found. Using the projector-augmented wave (PAW) method [Blo94], [Blo03] allows us to get rid of the core electrons and work with soft pseudo valence wave functions. The pseudo wave functions don’t need to be normalized - this is important for the efficiency of calculations involving 2. row elements (such as oxygen) and transition metals. A further advantage of the PAW method is that it is an all-electron method (frozen core approximation) and there is a one to one transformation between the pseudo and all-electron quantities. Uniform real-space orthorhombic grids. Two kinds of grids are involved in the calculations: A coarse grid used for the wave functions and a fine grid (\(2^3=8\) times higher grid point density) used for densities and potentials. The pseudo electron density is first calculated on the coarse grid from the wave functions, and then interpolated to the fine grid, where compensation charges are added for achieving normalization. The effective potential is evaluated on the fine grid (solve the Poisson equation and calculate the exchange-correlation potential) and then restricted to the coarse grid where it needs to act on the wave functions (also on the coarse grid). Expansion in plane-waves. There is one cutoff used for the wave-functions and a higher cutoff for electron densities and potentials. Expansion in atom-centered basis functions. Solving the Kohn-Sham equation is done via iterative multi-grid eigensolvers starting from a good guess for the wave functions obtained by diagonalizing a Hamiltonian for a subspace of atomic orbitals. We use the multi-grid preconditioner described by Briggs et al. [Bri96] for the residuals, and standard Pulay mixing is used to update the density. Compensation charges are expanded to give correct multipole moments up to angular momentum number \(\ell=2\). 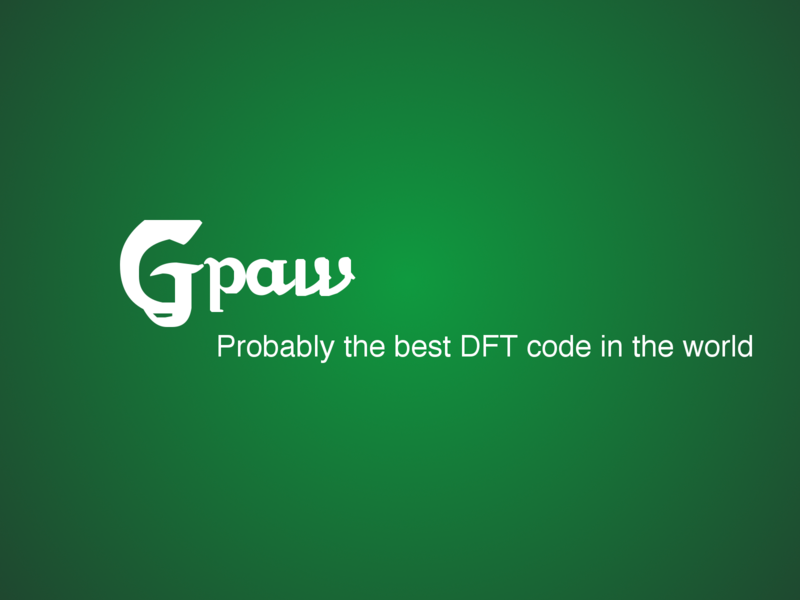 GPAW is released under the GNU Public License version 3 or any later version. See the file COPYING which accompanies the downloaded files, or see the license at GNU’s web server at http://www.gnu.org/licenses/. Everybody is invited to participate in using and developing the code.